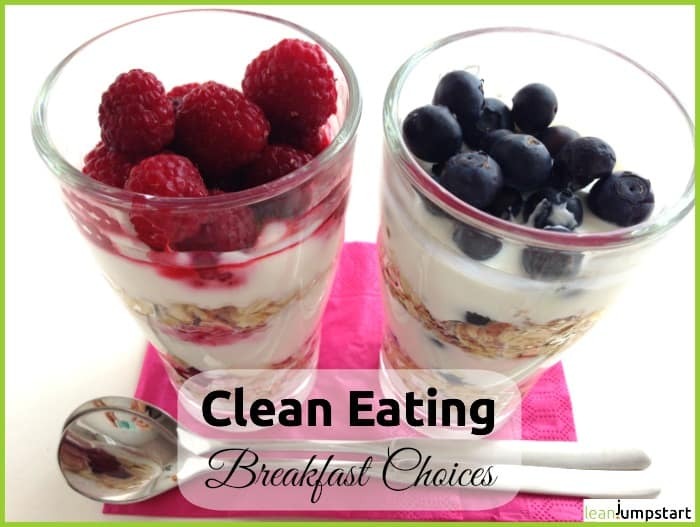 Clean eating breakfast recipes will be the focus in this post. For an 80/20 approach, you will find here only ideas for easy recipes with little preparation time including a short video. 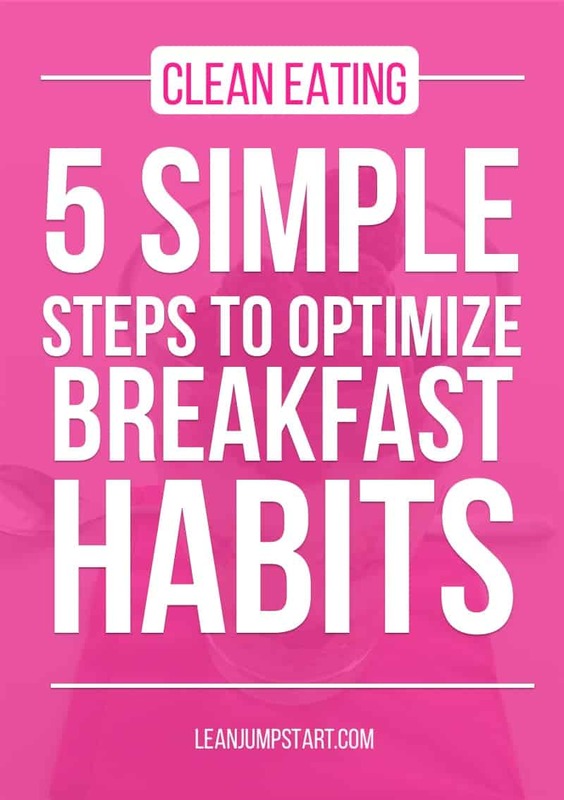 In addition, expect five simple steps that will help you optimize your eating habits in the morning. Among nutrition experts, breakfast is regarded as the most important meal of the day. Like drinking water, healthy eating in the morning is a typical keystone habit – a catalyst for other good routines. It is your springboard into a good start that encourages healthful behavior throughout your day. Nutrient dense foods stimulate your metabolism and influence your blood sugar level in a positive way. Therefore it is so important to select carefully, what you eat in the morning. If you are skipping your morning meal because you are trying to lose weight, you can actually sabotage your weight loss efforts. Studies have shown that going hungry in the morning can cause obesity, diabetes and cardiovascular diseases in the long run. If you don’t replenish energy reserves you’ve used up over the night, you might suffer hunger pangs before lunch. Nothing edible will be safe from you, and you will have a hard time resisting sweet calorie bombs. To function smoothly, your body needs a big chunk of healthy energy. What is a clean breakfast? If you start your day with toast with jam or Nutella, your body immediately switches into carbohydrate burning mode in the morning. That means that your body doesn’t burn any fat. 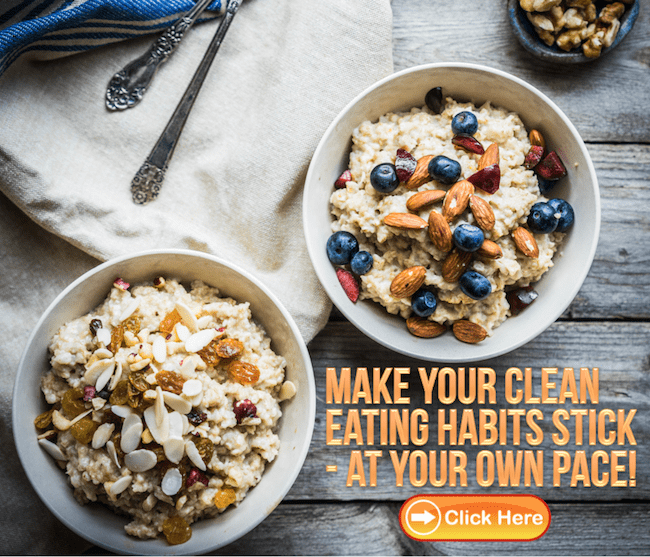 On top of that, if you begin your day with simple quick carbohydrates (white flour, sugar), which are the main components of honey pops or chocolate cereals, you risk feeling hungry all day. A perfect breakfast routine should incorporate carbohydrates rich in fiber (e.g. grains and high fiber fruits), lean protein and healthy fats (e.g. nuts). This combination is satiating for a long period of time and provides the necessary energy for you to make it until noon. There are a few rules that must be adhered to for this meal to be a success. It has to taste delicious, be simple to prepare, and be sustaining. 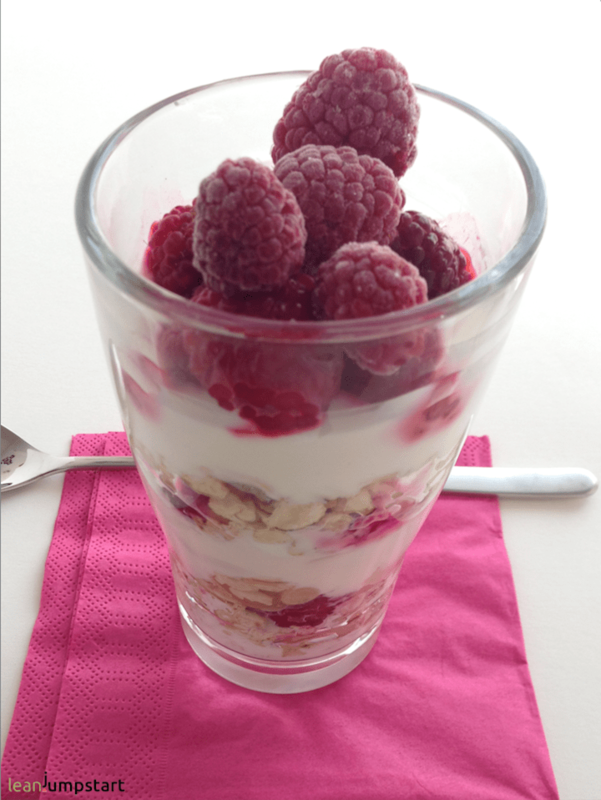 A yummy alternative to toast with jam is self-made muesli without added sugar. Remember the homemade muesli I presented to you in the context of increasing whole grain consumption? I also included some yummy inspirations from my valued readers. Healthy homemade muesli is usually made of whole grains, nuts, dry or fresh fruits with milk or yogurt. Nutrition experts have long praised this kind of clean breakfast as the healthiest option available. Depending on the season, you can combine whatever your heart desires. We are also huge fans of the crunchy type of muesli, called granola. Overnight oats you prepare the night before are another perfect option. The DIY mix chart below provides you with ideas for three food categories: fruits, whole grains, and proteins. Please choose only ONE item from each category! The “extra” category is optional and should be used scarcely if weight loss is your goal. Instead of almonds, you could also use 2 teaspoon almond butter. The teaspoon honey you could replace with maple syrup. And in the following a quick and easy recipe based on the DIY mix chart for a yummy, gluten-free blueberry muesli and don’t miss my short video below. Enjoy a well-balanced, satiating high-fiber breakfast! The quickest results you get when you mix together all 4 ingredients, e.g. in a muesli bowl. For the eye-catching layer effect on the photo above, I use a Latte Macchiato glass. A dessert glass bowl would do the job too. Tip for a nutty taste: Toast the oats with almond flakes for some minutes in a skillet at medium heat and add them to your muesli. 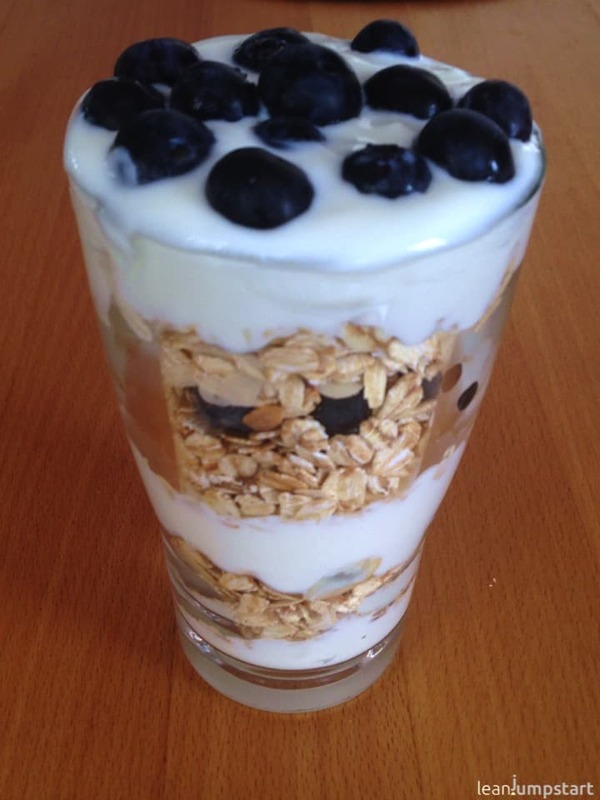 To save time I toast a huge amount of oats & almond mix in advance and store it in a mason jar glass. How does a healthy, hearty start of the day look like? A delicious egg meal, like spiced scrambled eggs combined with veggies (tomatoes, peppers, mushrooms), offers high-quality protein at a low price. Add a slice of whole grain bread, and you have a healthy breakfast choice. Another hearty idea is to combine Mozzarella cheese, tomato, and 1/2 whole wheat bread. Or how about enjoying heart-healthy smoked salmon with cucumber and a slice of whole grain toast? Tim Ferris, the best selling author of The 4-Hour Workweek, swears by the incredible fat-loss properties of whole eggs, lentils, and spinach … and as a big lentil fan, I can confirm that it tastes delicious. Think about your single most unhealthy breakfast that you tend to desire most often. Do you find yourself often craving fatty donuts, white bread or sweet supermarket cereals? Try to replace this with one of the options above. (e.g. replace sweet supermarket cereals with homemade sugar-free muesli using the mix chart above, or print out my clean eating blueberry muesli if you like it). Make sure to plan not only for dinner but also for your breakfast in your weekly meal planner. -> Click here to print out the meal planner template! Put the necessary items for your desired meal on your running shopping list and make sure that you always have the ingredients on hand. Also include on your list sufficient and fast “breakfast to go” options, like fruits or low-fat Greek yogurt that you can carry with you. -> Click here to print out the running shopping list! Finally, if you can replace your single most unhealthy breakfast with a healthy option for a month, reward yourself with a cute new muesli bowl. A smart habit right after you wake up is to drink at least three cups of water or tea. It hydrates you, provides your brain with fuel, boosts your metabolism, supports your body by flushing out toxins, and may even let you feel satiated sooner. If you need some variation, make sure to check out my detox water ideas. The purpose of a healthy breakfast is not only regulating food intake but also to promote regularity and provide balm for the soul to prepare for a great start. A good idea is to try to start getting up fifteen minutes earlier to fit this important habit into your day. If you are not a morning person, then try to drink a breakfast smoothie, vegetable juice or milk. Click here for my ultimate breakfast smoothie recipe with 7 whole food ingredients. Even 1-2 cups of coffee is ok according to experts. Don’t eat when you find yourself hungry while standing in front of a bakery. The better option is to take with you a yogurt to go or a sandwich made with whole grain bread. This way you can enjoy food even while on the go. Click here for my homemade whole wheat bread recipe! PLEASE SHARE: WHAT’S YOUR FAVORITE MORNING MEAL? What’s your all-time favorite clean breakfast choice? Just one! Shout it out in the comment section below. Excellent tips! Sometimes I don’t feel like eating breakfast, so most mornings we make fruit & veggie-packed smoothies. Great ideas for starting the day off right! So many interesting options and helpful tips! Perfect for those trying to get on the clean eating wagon. Absolutely Britt! That’s my goal, helping my readers to simplify their clean breakfast habits. I feel so much better when I start the day off right with clean eating recipes. These are great tips! Lots of great options here. I love any kind of breakfast that has blueberries in it. Hey Danielle, I’m the same – you can never go wrong with blueberries one of the most amazing superfoods anybody would need. I am loving reading everything on your website. I do have a question. Do you have a chart similar to the breakfast one for lunches? I work in the office everyday and i’m looking for ways to pack a clean lunch. Even if it was just a list of how many servings of different categories. I regret, but I don’t have a lunch chart yet – but I love the idea and will let you know once I’ve created a clean eating lunch chart. Great breakfast options, Ashley, congratulations! Most of your choices are healthy and excellent! Please be aware that the nature valley breakfast biscuits have a high sugar content. For your protein cereal I can’t tell. I like the inspiration and guidance that you are providing for me. For Breakfast i like the whole grain cereals like oats with fat free milk and an apple with green tea sweetened with honey and some lemon juice. thank you Christine:) Your breakfast is a winner and delicious too. If you like cinnamon you could even sprinkle a bit over your cereals – with your apple and low fat milk it is a yummy little variation. thank you for shouting out! Obviously my DIY Clean Breakfast Mix above might be misleading…sorry for the confusion. For a healthy breakfast please choose only ONE item from each category. E.g. 1 apple + 1/2 cup uncooked plain oats + 1 cup almond milk + 1 tbs chia seeds (optional). I’ll adjust my challenge accordingly.